UMX 5/8" & 3/4" Pattern Printed Velcro® Safety Name Tag Lanyards - WearComfort® Models. More than 21 pre-printed pattern available for your Velcro® safety name tag holder lanyards. Just pick your favorate themes and add one or two Velcro® safety breakaway to make a custom safety name tag lanyards. The Velcro® tapes are firmly sewn-on our printed pattern webbing. They can be closed or open easily. The Velcro® can be located on the right or left hand side, or on the back of neck. Multiple safety breakaway Velcro® are available for your special requirement. Good for school, hospital, factory, or any place with extra safety required. Custom printed or without custom printed model available. Any safety name tag lanyards with custom colors, sizes or hardware attachments are welcome ! 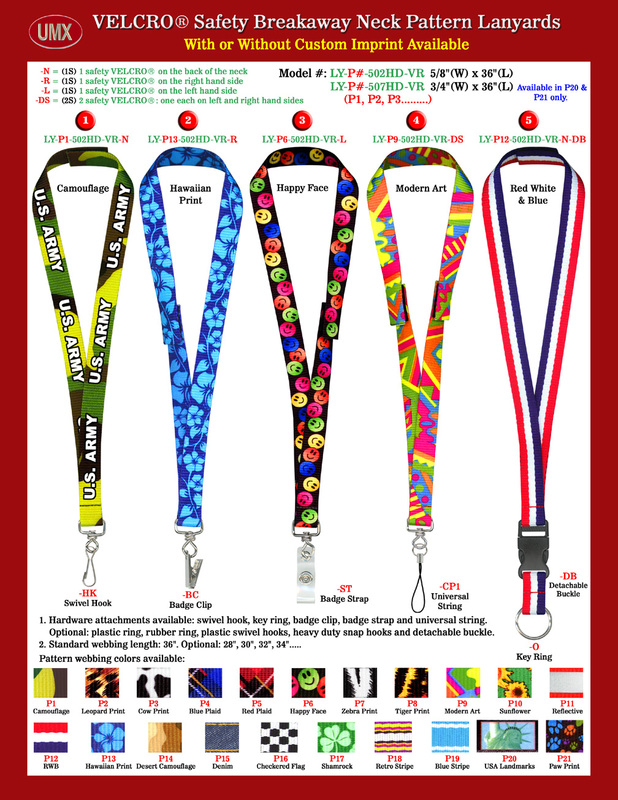 You are viewing Lanyards > Safety > 5/8" & 3/4" Pattern Printed Velcro® Safety Name Tag Lanyards. Comfort To Wear Safety Models.